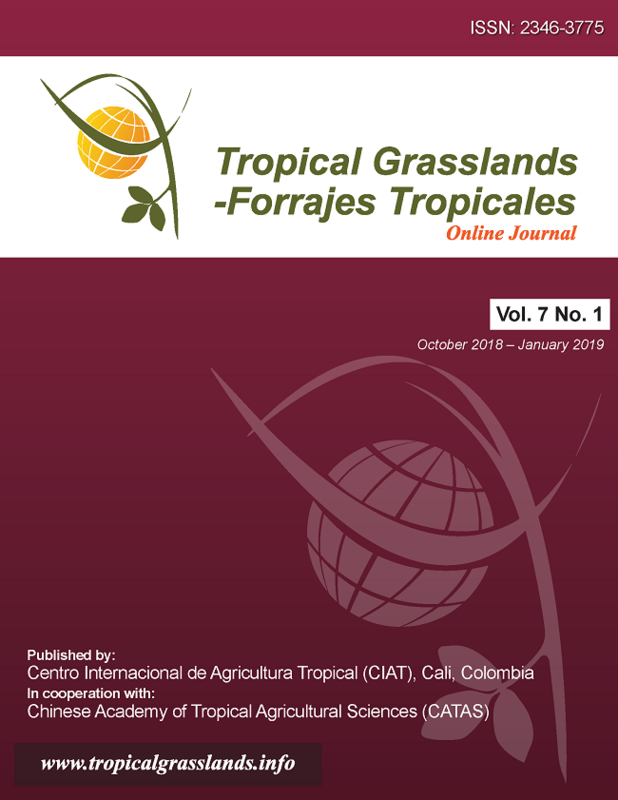 From the first issue of Volume 6 (January, 2018) on, all articles published by Tropical Grasslands-Forrajes Tropicales (TGFT) are licensed under the Creative Commons Attribution 4.0 International License. This permits anyone to copy, redistribute, remix, transmit and adapt the work, provided the original work and source are appropriately cited. This is the most common license for open access scientific publications. Tropical Grasslands-Forrajes Tropicales (ISSN official abbreviation: Trop. grassl.-Forrajes trop.) is an international, bilingual, peer-reviewed, open-access, online journal created in 2012 as the result of a merger of the former journal Tropical Grasslands, published from 1967 to 2010 by the Tropical Grassland Society of Australia Inc., and the former journal Pasturas Tropicales, published from 1979 to 2007 by the International Center for Tropical Agriculture (CIAT, its Spanish acronym). The Journal is published every four months by CIAT in Cali, Colombia, with the issues corresponding to the periods February‒May, June‒September and October‒January, respectively. The creation of the Journal was made possible through an anonymous donation in memory of the late José M. Toledo, leader of the then CIAT Tropical Pastures Program in the 1980s. The Journal is currently sponsored by the Chinese Academy of Tropical Agricultural Sciences (CATAS). This allows publication without any article submission and processing charges (APC). Tropical Grasslands-Forrajes Tropicales is managed by a 7-member Management Committee, including the two Journal editors. The Journal relies upon a 23-member Editorial Board.The Journal is committed to following standards of ethical behavior as summarized in its Publication Ethics and Malpractice Statement. The Journal editors are Lyle Winks, based in Brisbane, Australia, and responsible for contributions in English language; and Rainer Schultze-Kraft, based in CIAT headquarters, Cali, Colombia, and responsible for contributions in Spanish language. Registration is not required if you wish only to access the Journal and eventually download a selected article. If you wish to be alerted about news related to the Journal, e.g. as soon as a new issue is available, please Subscribe to the notification list by entering your e-mail address. Make sure that you tick the "author" option at the bottom of the "Register" site if you wish to submit a typescript. Through the "Search" tool on the navigation bar, current and past articles published in the Journal can be found, on the basis of volume number, year of publication, author, or keywords (including words in the article’s title). The "Current" and "Archives" buttons provide access to the Journal’s most recent and past issues, respectively. Instructions on submission details, including Author Guidelines, are provided under "Submissions". In the "News" section, relevant information on and links to forthcoming scientific events, new research initiatives, project developments, important publications, and the like are presented. Through the "Former Journals" button, the complete archives of Tropical Grasslands (44 volumes) and Pasturas Tropicales (29 volumes) can be accessed. For the latter journal, articles can also be searched via alphabetical lists of authors, species names, and/or keywords (‘temas’).